Following the tourist trail in any city can be tiring. Being funneled around like sheep, from one queue to the next can be a soul destroying process. That’s not to say the sights aren’t worth the hassle, but Lou and I were looking forward to moving away from that and seeing some more of Hong Kong. The accurately named (although I didn’t keep count), 10,000 Buddhas monastery is located in Sha Tin and takes about 45-minutes to reach from Yau Ma Tei, Kowloon, where we were staying. It would be our first stop of the day. The temple itself is set along the mountainside in Pai Tau Village and includes a 430-step ascent to the top, lined with a huge variety of gold buddhas to keep you entertained. And the buddhas come in a vast array of shapes, sizes, facial expressions, and poses. The 10,000 Buddhas monastery is not actually a monastery, there are no monks working there and the area is looked after by caretakers. Despite some positive comments on TripAdvisor, the area was very quiet and I think it’s location, going north and away from the main city, had something to do with this. We enjoyed the ascent and the tranquility alongside the specter of all these gold buddhas – it was a great way to start the day. With our quota of buddhas filled for the day, we decided to head across to the street markets in the Mong Kok. The markets in Hong Kong are crazy – dirty, smelly, packed and a lot of fun. You can buy anything from tacky tourist gifts to vintage watches – I kept an eye out for my vintage Omega (has been on my radar for awhile) but there was nothing quite suitable despite a great choice in some places. Lou really enjoys the markets, she is very fond of the small collectibles and bargains on offer in these places. Lou also loves food. She should be fat. Really fat. But a love of gummy bears and an unusually high metabolism mean she is able to consume anything and everything without putting on a pound. Fortunately for me, I share some of the same metabolic traits and Lou, over time, has opened my pallet to enjoying some fantastic food. In Hong Kong, this was no different and we were keen to try the famous Tim Ho Wan, a Michelin-starred restaurant with locations across the city. The beauty of Tim Ho Wan is that he has not increased his prices for decades, meaning the two of us were able to eat a good sized meal, with tea, for about $30USD. The restaurant does some amazing dim sum, the jewel in the crown for me, was the pork buns which make up one of the Big Four Heavenly Kings. Their description pretty much sums it up. I could have eaten these for days. To work off the food, I decided to play basketball. We had spotted a court just around the corner from our hotel so I threw some shorts on and walked around to see if anyone was there. Luckily for me, there were a couple of guys shooting so I joined them and spent the next couple of hours shooting and playing a little pickup. Now I know I say this every time, but I love how easily basketball connects people. Hong Kong loves basketball and I found out more about the locals passion for the game the following day. We continued the market, food, and shopping themes the following day by venturing into the local neighborhood on Kowloon to look around the shops. I have NEVER seen so many Nike stores in such close proximity – at one point we counted six Nike stores on the same street. And they stocked a good variety so it wasn’t like being in the same store each time. Along the way, we noticed posters attached to lamp posts advertising various basketball stores around the city. If you get off the main drags and into the lanes or find the stores in the basements or on the first floors of buildings you can find some fantastic basketball stores. The Air Jordan collector vibe runs strong in Hong Kong with many of the independent collector stores carrying tons of vintage shoes. We had a blast wandering around these. In the afternoon I was introduced to Nam, a friend Lou had made through one of her Facebook travel groups. Nam had studied in London so had great English and spent an afternoon to take us around the city! What a kind person – Nam, if you ever read this, thank you for your time! Through Nam’s recommendations, we were able to try waffles, normally sold through street stores in the city, they come with a variety of juices and flavors inside each of the small waffle pellets. Definitely try these in Hong Kong, they make a great snack. Nam also took us to a bird market and through the flower markets so we got to see some of the sites in the city that we would not have found otherwise. After a splendid afternoon, we decided to head out for dinner and a drink. We settled on the Yum Cha restaurant at Central, on Hong Kong island. If you could bottle up Lou’s happiness you would do it at Yum Cha. She beamed as we worked our way through too much food, including fantastic custard buns. Most meals are served with tea and in Hong Kong, this takes the form of jasmine tea with honey and lemon. I’ve tried to recreate the magic of this tea in other places around the world on our subsequent travels but I just can’t match it! The food and drink in Hong Kong were a big highlight for both of us. If Angry Birds made yum cha . . . In order to work off another huge dinner, we headed to the rooftop bar at SEVVA (see header picture). The bar might not be the highest in the city but it sits snuggly in amongst the skyscrapers and provides a strangely calm and tranquil atmosphere. Despite the insane drink prices we enjoyed the view and the rest following dinner and the walk. 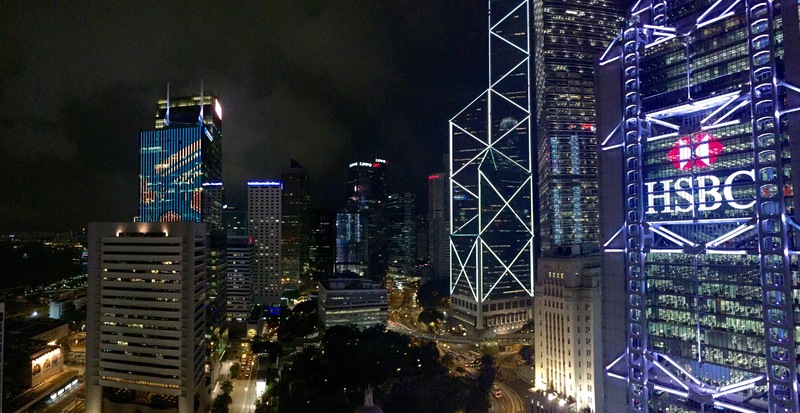 Our time in Hong Kong had been fleeting but it was packed with highlights. I reasoned with Lou that I could go back to Hong Kong, with a bit more time I’m sure this city has much more to discover!